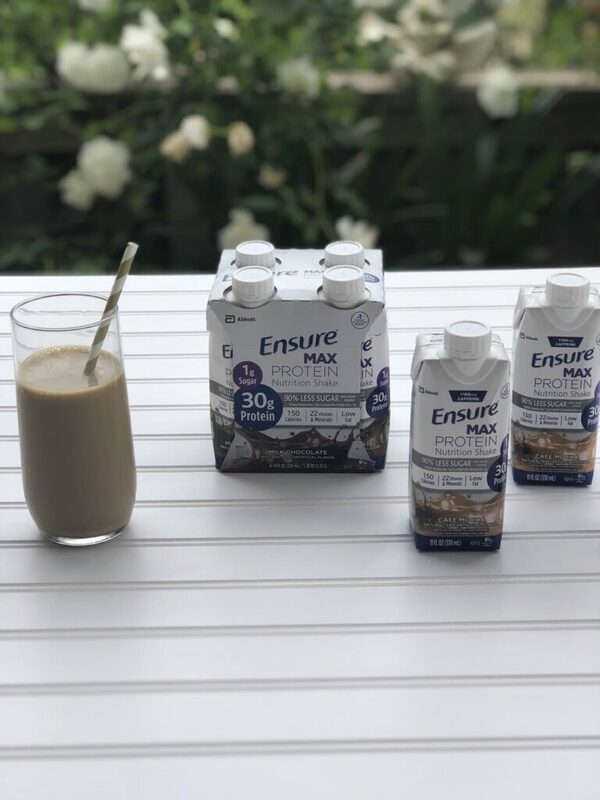 Through my partnership with Ensure, I’ve learned so much about making protein a priority, especially for women in their 40s and 50s. 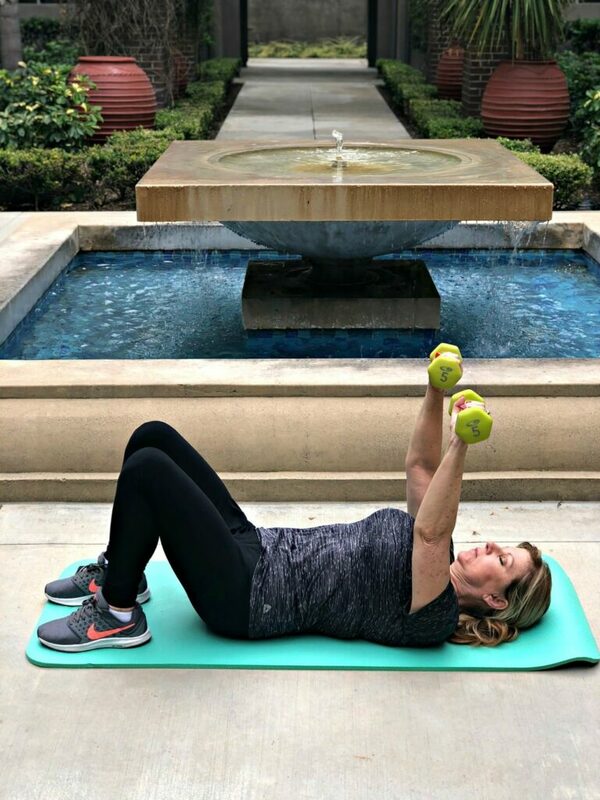 I knew that protein is essential to our everyday health, but I did not know that as we age, our bodies begin to slow down the ability to break down foods and absorb nutrients and that we need protein more than ever. If you don’t get enough protein in your diet, it can have a big impact. You may remember from my last post that I’ve been more mindful of my health this year. I want to be the strongest I can be, from the inside out. I plan to age gracefully and age well, and I am willing to educate myself and do my part. Read on to learn, as I did, about making protein a priority, as well as easy tips to increase protein intake. Most people don’t actually know how much protein they should be consuming on a daily basis. For example, a person weighing 150 pounds needs roughly 54 grams of protein a day, according to the dietary recommendations. To put that in perspective, one egg has about 6 grams of protein. Protein offers important benefits for our metabolism, our balance, weight management, bone density, rebuilding muscle mass and even mental clarity. That’s why getting the right amount and right kind of protein is so important. Ensure Max Protein is a new nutrition shake from Abbott. It’s perfect for those of us 45+ who want to easily get high-quality protein into our diets. It has 1 gram of sugar, 1.5 grams of fat, 150 calories and 30 grams of protein, which goes a long way toward meeting our protein goals for the day. It is available in two delicious flavors – Café Mocha and Milk Chocolate. If you like a caffeine pick-me-up during your day, the Café Mocha flavor is perfect because it has as much caffeine as one cup of coffee. 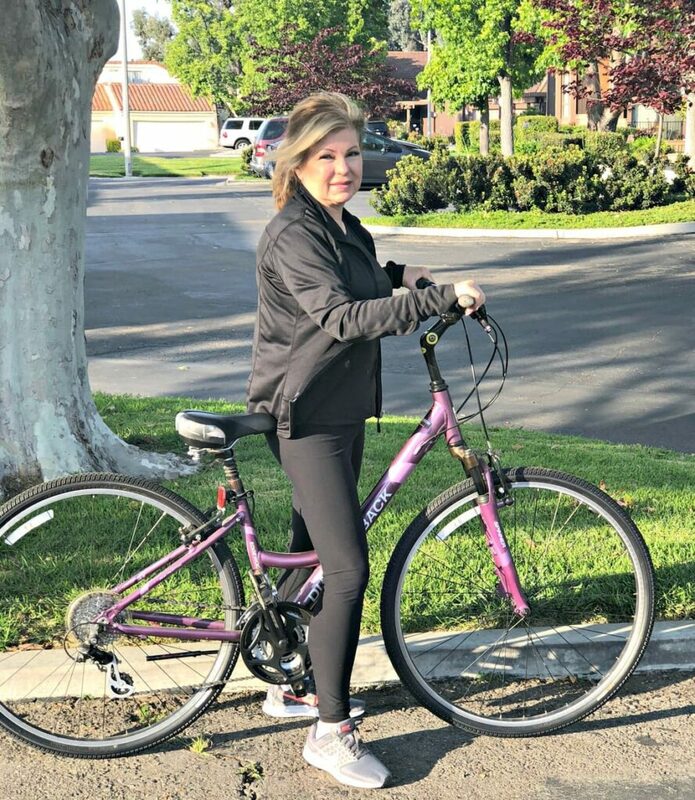 To learn more about our protein needs as we get older, I participated in a Q&A with actress and health-advocate, Kate Walsh, and Suzette Pereira, an Abbott researcher. Check out the below video to hear more from Kate on protein! Ensure Max Protein has been developed by Abbott, which means I know it’s coming from a scientifically-proven and trusted brand. Include protein in every meal. Eating protein in the morning can make you feel fuller and keep you going until lunch. According to Suzette, science shows that spreading your protein throughout the day has benefits. Eat the protein part of your meal first. It can help you to feel full and keep our blood sugar more stabilized. Add protein-rich foods to your salad such as chicken, turkey breast, salmon, almonds, and cheese. Canned fish is a convenient source of high-quality protein and beneficial omega-3 fatty acids. Choose leaner cuts of meat and serve larger portions to increase your protein intake. For those who want less meat in their diets, choose edamame, milk, and dairy products such as yogurt or cottage cheese, and tofu. Choose protein for snacks. Try cheese, nuts, hard-boiled eggs or beef jerky (choose high-quality lean jerky from grass-fed animals). Pair your fruit with peanut, almond or cashew butter. Know your numbers. You can use one of the many food tracking apps available to help keep track of your protein intake. About 75% of the protein we eat in our diets should be complete or high-quality protein. A complete protein source is one that provides all of the essential amino acids. 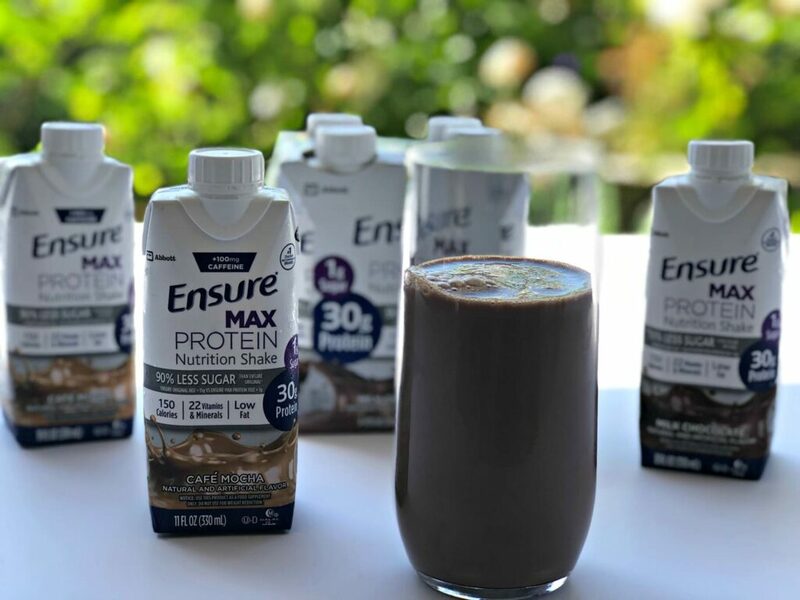 Ensure Max Protein contains this type of high-quality protein so when it’s difficult to meet your protein intake goals, it is so easy to supplement with Ensure Max Protein. 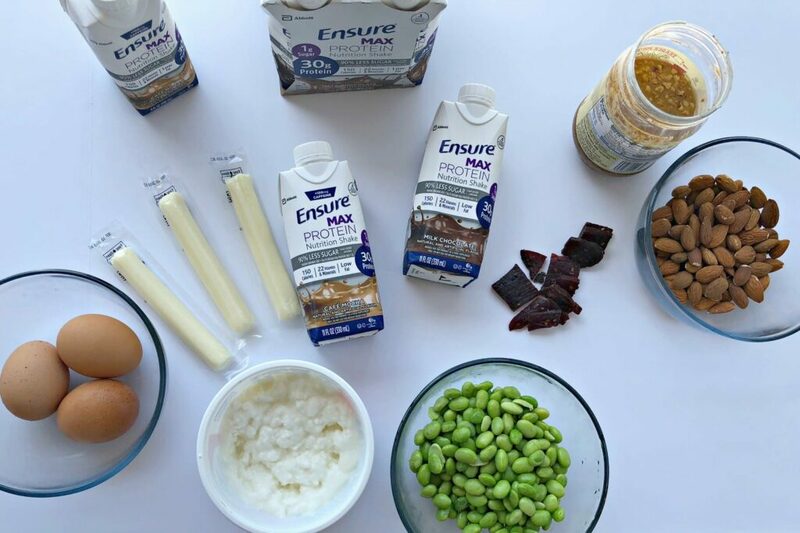 Find Ensure Max Protein nationwide at most major retailers and online. Get your own today at Target.com.